In 1986, Judas Priest released Turbo, a heavy metal album inspired by the Porsche of the same name. 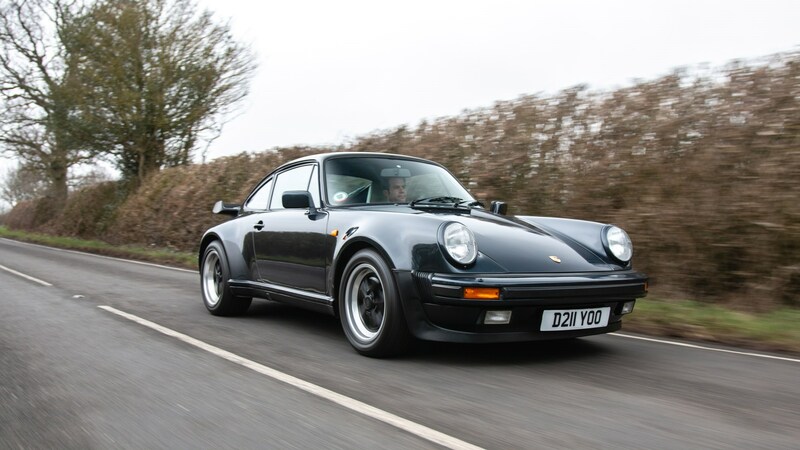 Guitarists Glenn Tipton and KK Downing had each bought a 930 Turbo LE after visiting the Zuffenhausen factory, and the record – including songs such as Turbo Lover and Reckless – was tailor-made for adrenalised drives in a hot-headed 911. Now in its 49th year, the 911 Turbo has followed a similar trajectory to many ageing rockers. It started as a wayward wild child, snorting tequila, lobbing televisions into swimming pools and ending the night backwards in a hedge. Then, over time, it booked itself into rehab, balanced its chakras and took up pilates. Today’s Turbo is leaner, fitter and faster than ever: more stadium stalwart than punk upstart, and the closest thing to a sensible supercar. So why do we yearn for Hot and Crazy Days with the anarchic original? Porsche’s introduction to forced induction came via Can-Am. The 917/30 racer developed up to 1100bhp – a terrifying prospect in a car that weighed 849kg – and destroyed all-comers in the 1973 season. Point duly proven, a prototype 911 Turbo was unveiled the same year. The production car followed in 1975, its 3.0-litre flat-six fortified by a Kühnle, Kopp and Kausch (KKK) blower serving up 0.8 bar of boost. Peak power of 265bhp meant 0-62mph in 5.5 seconds and 155mph: within spitting distance of the Lamborghini Countach and Ferrari 365 GT4 BB. However, this wasn’t a pared-back road racer like the epochal 1973 Carrera 2.7 RS; it had more power, more presence and more equipment. Porsche’s marketing department insisted on luxuries such as air conditioning, leather seats, electric windows and a four-speaker stereo. 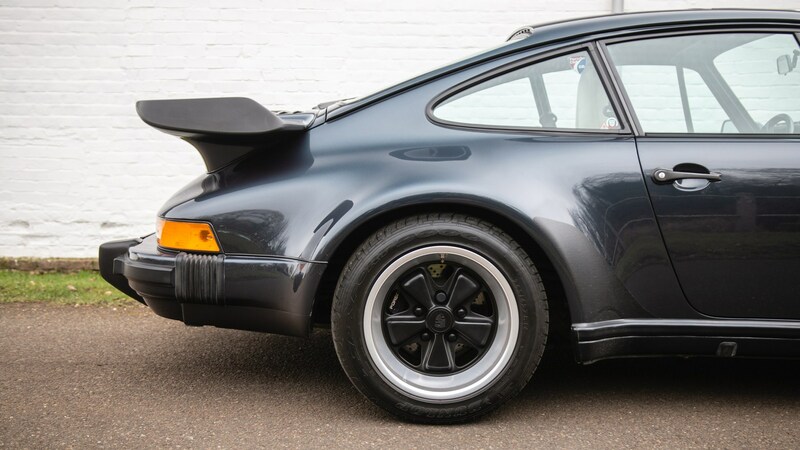 The car even had a different internal Typ number – 930 – to reflect its elevated status. An ideological line had been drawn in the sand, one that still exists between the Turbo and Porsche’s GT models today. The Turbo was an instant hit: the planned production run of 500 cars doubled to 1000 almost immediately. Then as now, however, Porsche purists were a tough crowd, and many disliked the 911’s new direction. The most barbed criticism was reserved for its handling, the on/off nature of power delivery exaggerating the 911’s tail-happy tendencies. Not for nothing did Germans nickname this car der Witwenmacher (the Widowmaker). In the 1980s, ‘TURBO’ was plastered over everything from hairdryers to VHS players, and Porsche’s flagship became a poster car, sharing bedroom wall-space with Spandau Ballet and Sam Fox. A potent status symbol, it was also the supercar of choice – usually in Guards Red – for London’s new breed of yuppies. Thrusting Thatcherite capitalism never looked so good. The sucker-punch styling of the 930 was, after all, key to its success. Its best angle is the rear-three-quarter: all swollen haunches, deep dish wheels and outrageous wing. The rear is stretched a full 165mm to accommodate steamroller 8x16-inch Pirelli P7 rubber, although the car is still slimmer than a 718 Cayman. Interestingly, Porsche geeks only refer to the pre-1978 wing as a ‘whale tail’. The later, flatter version seen here is a ‘tea tray’. The Turbo also walked the talk, of course. The 1978 update brought a 3.3-litre engine and 917-derived brakes. Power leapt to 300bhp, 0-62mph dropped to 5.4 seconds and top speed was 160mph. Even quicker versions followed, including the limited edition 330bhp LE immortalised by Judas Priest, also available in ‘Flachbau’ SE spec with pop-up headlights. 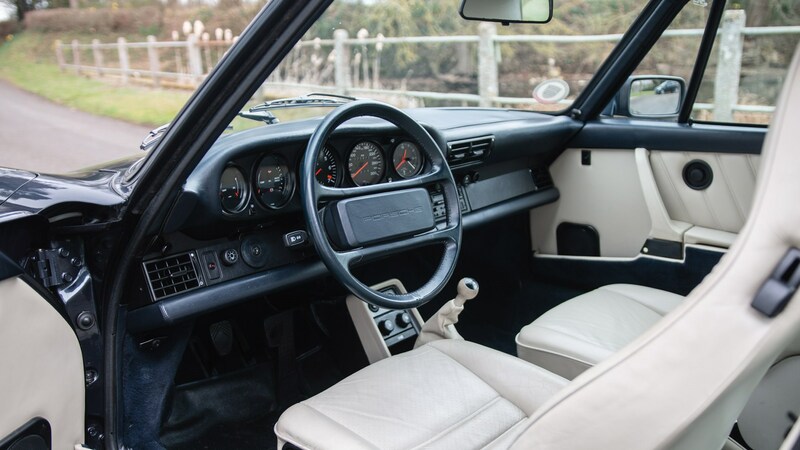 Despite its steady evolution, however, the Turbo retained a four-speed ’box until its last year of production in 1989, when the slicker G50 five-speeder was finally introduced. Soon afterwards, 930 gave way to 964 – a last hurrah for the rear-driven Turbo before the all-wheel-drive 993 debuted in 1996. Even parked alongside a 996 GT3 and 2.7 RS replica, the Turbo simmers with mechanical malice. I’m in the showroom at Paul Stephens Porsche in Essex, where a 1987 930 3.3 awaits. Its paint is subtle Marine Blue, its wheels the regulation black Fuchs. Outside, the sky is the colour of lead and specks of drizzle are flecking the windows. Perhaps that fearsome reputation has clouded my judgement, but I have a distinct sense of foreboding. Will Scottish Widows soon be welcoming a new customer? The 930’s cabin has all the quirks of a classic 911: tombstone seats, floor-hinged pedals, unfathomable heater controls and a steering wheel that obscures the dials. Actually, that’s not quite true: the speedo needle only disappears at speeds beyond 100mph. It’s notably plusher in here than a common-or-garden Carrera, with niceties such as leather-wrapped door pulls and heated seats. The combination of cream hide and blue carpets might be too Miami Vice for some, though. This 44,000-mile car has the optional limited-slip diff, which aids the 911’s already impressive traction out of corners – one advantage of positioning the engine aft of the rear axle. However, that’s your lot in terms of driver aids; there’s no ABS and stability control comes via your right foot. 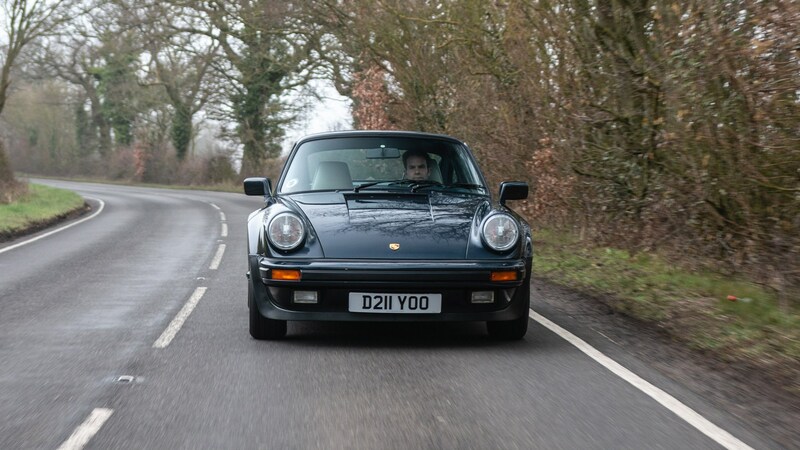 Not that you’d mistake any 32-year-old 911 for a modern car. The pedals are skewed awkwardly sideways and feel ponderously heavy at first. Likewise, the ‘915’ gearbox is an acquired art: stubborn as a tired toddler when cold, yet deliciously tactile once you accept its idiosyncrasies. It feels special in here, too. The forward view is framed by those famous front wings, the mirrors filled with voluptuous wheelarches. My inner eight-year-old is cartwheeling with excitement. The air-cooled six churns into life with an industrial hum. The boost gauge, located front-and-centre inside the rev-counter, lies dormant – but not for long. As soon as the road opens, I go for it. There’s lag, plenty of it, but beyond 3,500rpm the hounds are unleashed. An invisible hand shoves me between the shoulders, the engine note becoming a guttural howl as it romps to the 6,700rpm redline. This is old-school turbo boost: raw, uncouth and addictive. And it feels madder than King George after an evening on absinthe. However, the roads on the Essex/Suffolk border aren’t only made up of long straights where the speedo needle goes into hiding (ahem). There’s also a bountiful selection of bends, and here the 930 has much to prove. Its steering is direct and more talkative than Graham Norton; the whole car alert and light on its feet. It’s less frisky than a narrow-bodied 911 of the same era, perhaps, but still alive with abundant feedback. Turn in with your fingertips, keep the throttle rock-steady, then feel the rear squat as you accelerate away. I’m acutely conscious of the notorious sting in the tail, especially on cold, damp Tarmac. It’s there alright, ready to catch errant rock stars unawares, but with a communicative chassis, confidence-inspiring brakes and relatively low limits – certainly compared with the Turbos of today – this isn’t the salivating psychopath of motoring myth. Keep the laws of physics foremost in your mind and the 930 is unlikely to bite back. Just don’t say you weren’t warned. 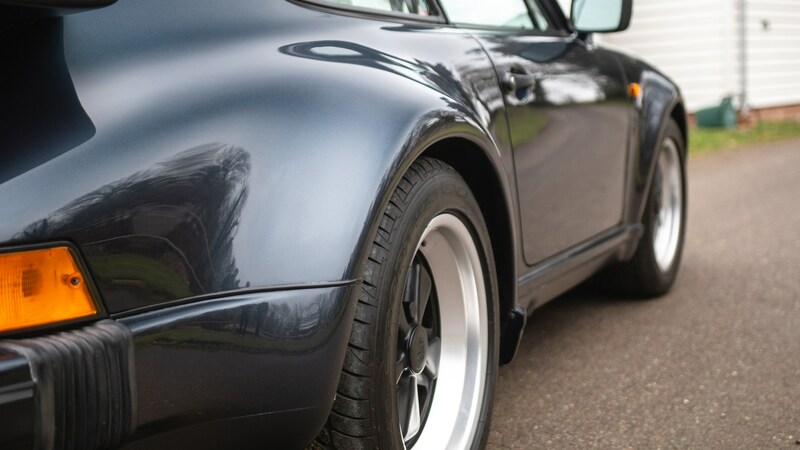 Drive a 930 and you’ll spend hours afterwards remembering that almighty wallop when the turbo spools up. Such on/off edginess would be unacceptable today, yet it’s also what makes this iconic Porsche special. Call it the classic car conundrum: where faults becoming endearing quirks. The latest 991 Turbo may be crushingly capable, but it’s more Bon Jovi than Black Sabbath. Ultimately, the Turbo doesn’t have the dynamic acuity of an RS, or the simple purity of a Carrera. It’s something else again: a larger-than-life super-GT equally at home on the Autobahn as the B1024. And it’s still the coolest looking 911 ever made. Many thanks to Paul Stephens (01440 714884) for loaning us the 930 driven here. The car is for sale at £89,995.